My article for the Great Katharine Hepburn Blogathon is on her 1955 film, Summertime. Here's Kate soaking in the beauty of Venice. 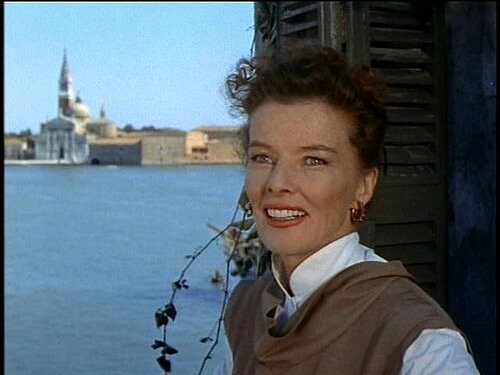 The enchanting film Summertime (1955) is a bittersweet romance featuring one of Katharine Hepburn's best performances and stunning location shooting in Venice. 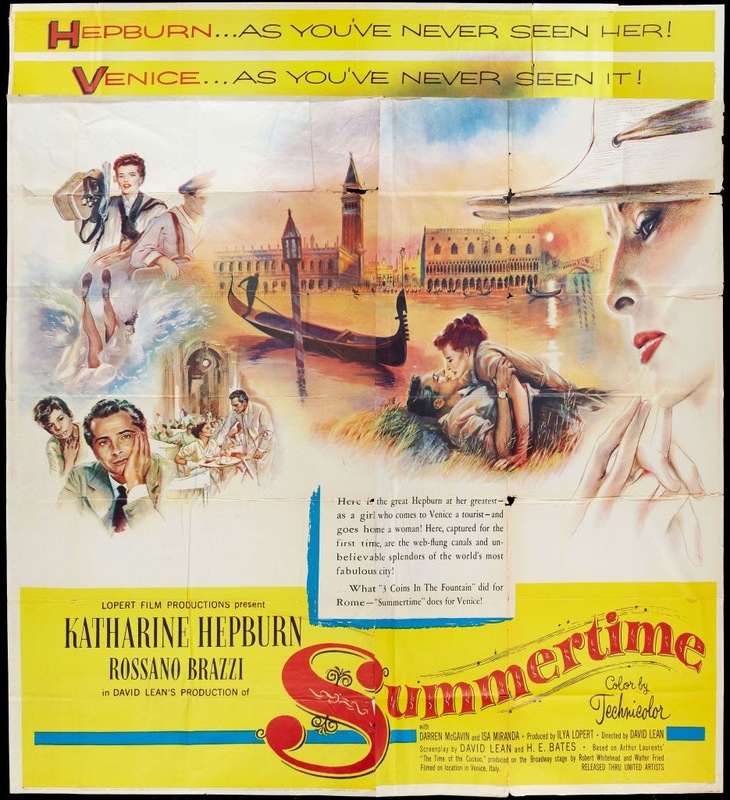 Summertime tells the story of Jane Hudson (Hepburn), a single secretary from Akron, Ohio, who scrimps and saves for a dream vacation to Venice. Jane is usually outgoing and independent, but she finds her confidence faltering once she reaches Italy. The other Americans in her hotel are married couples who really don't want to include her in their plans, so Jane aimlessly wanders the city until she meets a handsome antiques dealer, Renato (Rossano Brazzi), one evening in the Piazza San Marco. They begin a tender romance, but Jane balks when she finds out Renato isn't exactly the Prince Charming she envisioned. 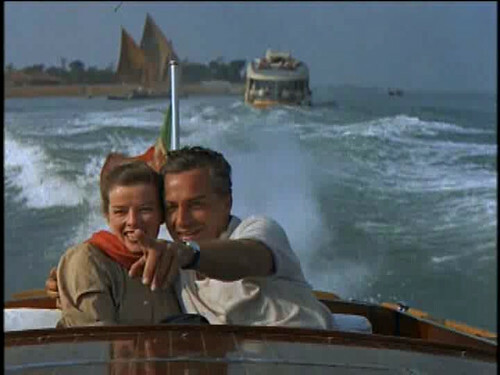 Katharine Hepburn and Rossano Brazzi enjoy a ride in a speedboat in Summertime (1955). British Director David Lean, best known for epics like Lawrence of Arabia (1962) and Doctor Zhivago (1965), always counted Summertime as his favorite of his own films, and his sensitive direction is one of the key's to the film's success. Lean insisted on shooting most of the film on location in Venice despite several obstacles: The studio thought it would be too expensive, the Catholic Church didn't want a film about middle-aged adultery made at its holy sites, and even Venetian gondola operators were up in arms because they feared the cameras would disrupt tourist business. Lean persevered and cinematographer Jack Hildyard filled Summertime with beautiful set pieces, like this scene in the Piazza San Marco. Lean also made significant changes to the script. Summertime is based on Arthur Laurents' play The Time of the Cuckoo, which was a huge hit on Broadway. Most of the play takes place in a hotel courtyard, which didn't exactly offer the grand vistas Lean wanted. Lean and novelist H. E. Bates, who co-wrote the screenplay, also significantly changed the plot and tone from the original. Hepburn's character was much more bitter and lonely in The Time of the Cuckoo, and Renato was a cynical Don Juan. A vintage poster for Summertime (1955). Even with beautiful Venice and a romantic love story, Summertime would have fallen apart without Hepburn's considerable talents. Hepburn is justly celebrated for playing fiercely independent women, but in Summertime she shows a touching vulnerability. The film begins with Hepburn on the train to Venice. She is the independent, outgoing Kate we all know and love, talking a mile a minute while rushing around the station. However, once Jane arrives in Venice, she falters. She nervously wanders along the canals taking videos with her home movie camera, literally alone in a crowd. Jane Hudson (Katharine Hepburn) and Renato de Rossi (Rossano Brazzi) enjoy a visit to Murano in Summertime (1955). Lean's choice to make Jane's personal journey the center of the film was a shrewd move. The secondary plot, a predictable love triangle between an artist (Darren McGavin), his wife (Mari Aldon), and the hotel owner (Isa Miranda), is deadly dull. Also, Brazzi is charming and handsome enough, but he isn't a great actor, and Hepburn has to compensate for his performance, which she does beautifully. I first saw Summertime when I was in high school, and while teenage me thought it was the height of cinematic romanticism, I'll admit that as an adult I can see some flaws. The comic scenes feel forced, especially those between Hepburn and a street urchin (Gaetono Autiero) she befriends. Also, the gender politics are very 1950s, although it is refreshing to see a movie about two middle-aged people falling in love, which is something that doesn't happen very often in 2015 Hollywood. 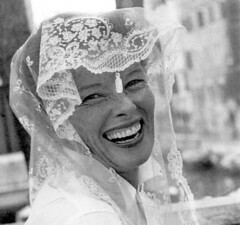 Katharine Hepburn tries on some Venetian lace during a break on the set of Summertime (1955). Despite the some minor flaws, it's easy to fall under Summertime's spell. Venice has never looked more beautiful, and Hepburn is radiant as a woman discovering love for the first time. I won't give away the heartrending final scene, but it is beautifully acted by Hepburn and Brazzi ( I give him full credit for bringing it here), and it is perhaps the best single scene in Lean's exceptional career. Summertime is available for streaming on HuluPlus. It is also available on DVD from The Criterion Collection. Visit margaretperry.org for more of The Great Katharine Hepburn Blogathon. Both Venice and Katharine Hepburn are stunning in this film. You're right – a love story with two middle-aged people certainly doesn't happen often in 2015 Hollywood. Thanks! Yes, if they did a remake today, it would star Selena Gomez or something. Such a romantic film - and such a lovely post. Kate is just perfect in this film and as for Rossano.... well, that Italian scenery is magnificent, isn't it? He is a handsome man. I always thought he made the best Professor Bhaer out of all the versions of Little Women because it was actually believable that Jo would want to marry him. Great post! Lovely film with enchanting scenery and superb emotional range from Kate, as per usual. What struck me interesting is that Kate was the same age as I am now when she made this film. Who looks THAT gorgeous at age 48?! Kate, of course. Kate is so beautiful that it's hard to believe she never had a romance back in Akron, Ohio.